Murder Mysteries with horses a specialty! Hogan's mysteries feature warm characters with unsuspected strengths, their romance interrupted by intrigue and danger. Helen competes with Spirit of Silky McTavish, her Pinto gelding. Coming over the bridge on cross country course, Willow Draw. America Star Books, new publisher for Helen's recent three novels, features Helen's art on the cover. The chestnut Arabian mare looking across the Colorado Rockies is the horse hero Rod Mannering rides in his quest for physical and emotional recovery. The Denver show is Rod’s first after a crippling injury. He finds Peppermint Land, son of an old friend, whipping a colt and orders the young trainer to stop. Instead, Peppermint throws a punch and kicks Mannering’s legs from under him. Gay trainer Tim Francis rescues Rod from the fracas, but neither man recognizes the depth of Peppermint’s enmity When Rod discovers Tim’s body a few weeks later, he vows to find the killer. A subpoena hits Mannering with a lawsuit for the full price of a condominium, a disastrous sum. Reeling, Rod hesitates to pursue the attractive Texas rider Ms. Blair, fearing rejection because of his physical and financial problems. When the Highway Patrol finds Rod’s daughter’s car abandoned like the vehicles of several women killed in the area in the last few years, he forgets all else. Meanwhile, Taylor Blair finds herself admiring Mannering who hires her to tutor his young apprentice. Working with Rod, she fears losing her heart to a man who rides a whirlwind. Rod and Taylor head into a brewing storm to search for his daughter Belinda. A trip wire sends Rod sliding down the cliff until he reaches a narrow ledge. Hanging there, he sends Taylor over the ridgecrest to rescue Belinda. His painful wait compels him to evaluate his life. Hogan’s mystery forces a decent guy to outwit a twisted young trainer and a devious developer An enticing woman with a mind of her own, a rival trainer, and financial problems complicate a life imprinted with powerful Arabian horses and Colorado mountains. Written for a horse club newsletter and for various writing contests where they won awards and compliments, the stories feature a variety of characters from girls who desperately want a horse to old trainers who face the reality they have too much arthritis to ride. Helen was the girl who wanted the horse, and in her show career she learned many important techniques from some of the old hands. The cover highlights "The Fake Pegasus," her fantasy about a lady biologist who discovers an isolated herd of pegasi the size of a crow. The woman risks her career to preserve the herd's secret. She even includes a horror story, "The Day the Rabbits Came" with telepathic four foot high rabbits who enforce their commands through their allies, bees and fleas. Maybe she had a nightmare after being stung by over a hundred bees one summer. 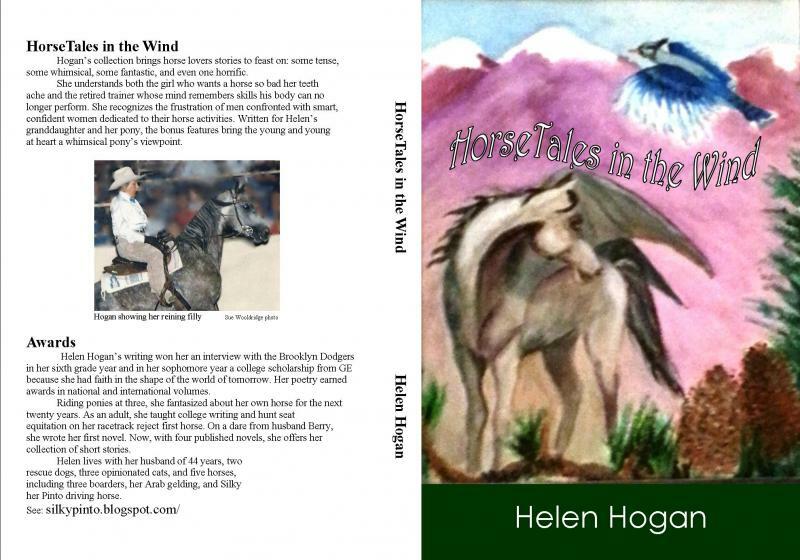 Helen's section on Chrisstmas stories that feature horses will add a new twist to the holidays. For finale, she offers the young an young at heart a couple of stories told through the eyse of a good-heearted pudgy pony who tries to figure out life and wants to amout to something. Within the first three pages Warning Shot’s reader sweats in South Texas September heat as Marshsll McCraddock discovers his dean’s stabbed body becomes prime suspect. Marsh struggles with grief over the loss of his best friend while taking on the job of dean of the agricultural college the Saturday before registration. The new teacher Alex Martin, hired by the dead dean to run an experimental new English program for the ag students, irritates Marsh at every turn, starting with the interview by detective Sanders. She rides her ugly horse too fast and has no inclination to climb the intricate social ladder of college politics. She challenges Marsh’s most difficult professor, good ol’ boy Henderson, to a horsemanship contest over Marsh’s protest. 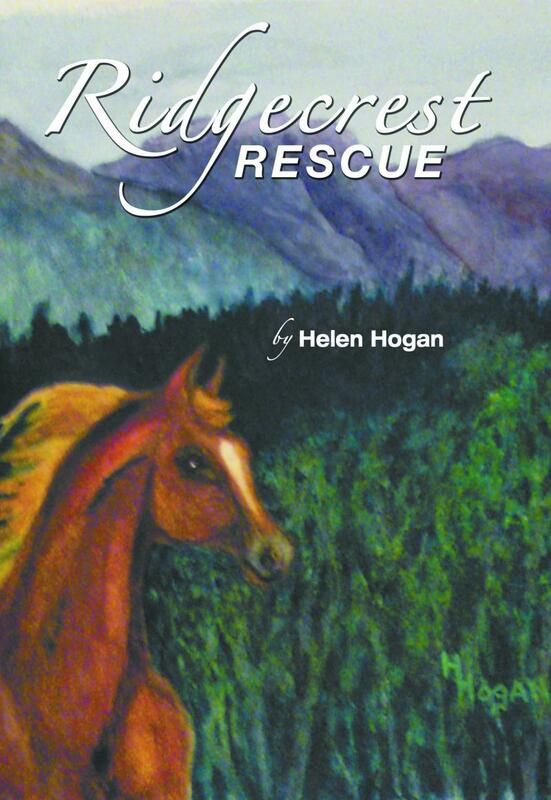 Helen Hogan, an experienced horsewoman and retired English professor, creates realistic action scenes and uses an omnipotent approach to get into the heads of her main characters. Hogan’s main plot ends like the final act of a tragedy with bodies on stage. She weaves the tension of the equestrian subplot to tantalize horse lovers with chase scenes and the ultimate contest, the race, where the heroine’s horse surprises his detractors who saw only his floppy ears and gawky conformation. Richer than traditional romance and more complex than the average mystery, Hogan’s novel Warning Shot has earned praise from novelists and horsemen. “She builds a suspense plot with skill,” comments Edward McGhee, author of The Chinese Ultimatum. “She makes you care about her characters, and she can write a good fight scene,” says award winning Western writer John McCord. “I meant to read for an hour and couldn’t put it down ‘til 3:00 a.m., “ complains Evelyn Wilson, English Department Chair. “I’m calling long distance to tell you how much I enjoyed Warning Shot. The tension was gripping, and you made me feel I was right there in South Texas in the sixties. 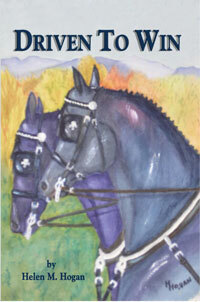 Of course I loved the horse sequences.” Horse breeder William Ball. DRIVEN TO WIN pits an American carriage driver against a murderer at the World Four-in-Hand Championship. When muggers smash Eric Magee’s hands the day of his arrival, he becomes desperate to persuade the committee to allow him to ride on the box of his carriage and direct a substitute driver. The members want to appear to help him, though none believe he has a chance. In a whimsical twist, they declare that if the driver is his wife, “the head may talk to the hands.” His girlfriend Calder, though lacking in experience, agrees, but still intends to show her own horse in a local event. On her first practice drive, she discovers the body of the reigning world champion driver, and Eric must prove that his mugging is connected to the slaying. Mike McLennan, American driver competing for world titles, says of Driven to Win, "She doesn't leave time for a mouse to sneeze. I was amazed at her understanding of the politics at these events." 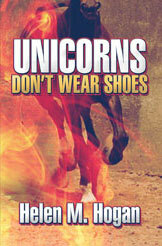 UNICORNS DON’T WEAR SHOES she rates as GP, The hero is a high school principal in Alvarado, Texas, where he rides his Quarter Horse stallion in “Non-Pro” cutting competitions. The night after Wesley Wilson meets Cathy McCleod at a cutting event, he discovers a body at the stable where he boards his Quarter Horse stallion Skipabeat. The detective grills him, “How do you know this man? Who is he?” Sheriff’s deputy Tommy Counts cannot believe the school principal does not know the dead man. Because the victim is dark skinned with black hair, investigators think he is Mexican. But Deputy Andy Rourke says he’s no Mexican. Wes has enough trouble trying to stay clear of the detective, but .. Wes and retired teacher Miss Millie suspect fraud at Fellowship Farms when they save her pony from the killing pen. Wes barely has time to make the school board meeting where he battles for his budget In a rare moment with Cathy, he takes her in his arms when his phone rings. One of his teachers is accused in the disappearance of a girl student from his high school. Mix in a surly stable foreman and a terrorist connection for an explosive conclusion.